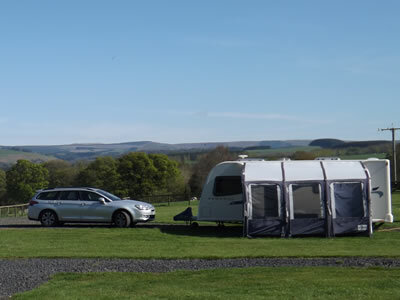 Just along our farm drive and with superb views over the countryside towards the Cheviots, we have developed this third of an acre site for Caravan Club members, overlooking one of our paddocks, quite often with sheep grazing in it. The park is mainly grass with part hard standing. Bairnkine CL is situated on a working farm nestling below The Cheviots, just south of Jedburgh in the Scottish Borders and only an hour's drive from Edinburgh, Newcastle or Carlisle. All pitches have electric hook up and two are hardstanding. There is a water point and a waste disposal point. Pitch per night £12 including WiFi. We ask for a £12 deposit with each booking. Take a look around the farm on either duck, deer, squirrel or badger walks or stroll to a hide by one of the ponds and watch the wildlife. We encourage our guests to explore the farm (though there is restricted access during lambing). We ask that dogs are kept on leads. We are never far away and always happy to help and advice on places to visit and things to do. Click on this icon to visit our dedicated Facebook caravan page. We look forward to welcoming you on the farm to relax and enjoy the Borders. Whether its just for a night or for a longer stay, we are sure you will find Bairnkine Farm perfectly placed as a base for your touring adventures.